Today is Mother’s day, and with that in mind I am going to do something that I have never done before. I am going to preach a mother’s day sermon. I know that sounds strange but I have really never done this before. Today we are going to take a break from the book of Mark to look at 2 Timothy chapter 1. Now before we get started I want to address the problems of doing a Mothers day sermon. There are a few. The first is, that not everybody who is here is a mother. In fact, there was a time when Elizabeth and I were married (about 3 years) that we dreaded Mother’s Day. You see we really wanted to have children but we couldn’t. So Mother’s Day was a hard day to attend church with the sting of not having kids. There is also the fact that sometimes it seems as if there is no application for the men who are in attendance. While these challenges exist I believe there are several reasons to do this anyway. Scripture says to give honor to whom honor is do. (Rom 13:7) Each of us has had a mom. And it is important to honor our mom’s for what they have done in our lives. Many people in our world today have had issues with their Dad’s that have effected how they view God. And while some might also have issues with their mom. The truth is you hear significantly less of those than Dads. The truths we are going to learn today can be applied not only to mothers and children but to every relationship we have. You see I believe today we are going to learn some basic pieces of what it means to disciple each other from some powerful mothers that changed the world. Before we go any further I want to take just a few minutes and Honor my mom. She is not here today but that does not mean she should not be recognized. Here is a truth for each of us, we all can honor and appreciate our moms whether they are here with us or not. Maybe some of you here today no longer have your mom living. You can still honor her. You can still thank God fro the influence she had in your life, and you can honor her by telling others of her. My mom is a great lady. She is a lot like me so she has to be great right 🙂 Just kidding. My mom is a lot like me, and that created many issues growing up. In fact, my mom and I had a love/hate relationship. Many times we loved each other but at the same time we hated what we saw and did to each other. I was not the easiest child to raise and my home life was not the perfect situation. Many times my mom and I argued more than we got along. My mom did the best that she could in the situations of life that we had. Looking back I can say that I am the man I am today because of her influence in my life. She taught me how to treat my wife with honor and respect. She prays for me and my family consistently. She believed in the call God had in my life when others did not. And most of all she taught me to trust and follow God. And for that I am and always will be eternally grateful. In one sense if any of you have been blessed in your life by me you can thank my mom. She has quite literally changed this world. There is another story of a set of mom’s in the Bible that changed the world that I would like to look at today. Turn to 2 Timothy chapter 1. This is the story of Timothy, Timothy was a constant companion of the Apostle Paul and was often sent by Paul to different churches that were encountering issues or needed some help establishing the church. 2 Timothy is actually a letter written to Timothy to encourage him in persevering in ministry. This is actually Paul’s last letter before his death so it is important what he wants to tell Timothy. As we look at this passage in light of mothers and the influence they can have on their children I want us to look at several investments that can be made to shape the character of those around us. The first of these is found in these first 2 verses. Here we see the close relationship with Paul that Timothy has. In fact, in some sense Paul thought of Timothy as his own son. Before we go to much further I want to notice that Timothy was able to have strong friendships. In our culture today, relationships are under attack. In fact, while we have more “friends and connections” because of social media today we have become more and more disconnected from true friendships that help us to grow. Timothy was not afraid to have close personal relationship with people. One thing we know about Timothy is he was probably the most loyal friend Paul had. Of all of the people on Paul’s team, there was no one like Timothy. For when Paul sends Timothy to the Philippian church, he says, “I have no one who is like-minded, who will naturally care for your state like Timothy.” “Like-minded” means equal-souled, our souls are the same, our spirits are the same, we are tracking together on just about every issue. This is important if we are to make disciples. The effectiveness of your discipleship is directly linked the the depth of the relationships you have. You’ll notice in our text that the first thing that Paul remembers when he thinks of Timothy were his tears; not Paul’s tears for Timothy, but Timothy’s tears. Timothy cried. Now what’s going on? Why does he mention this? Now, we’re not sure when that was, but we believe it was some departure that Paul and Timothy had. And I can make two guesses: once when Paul installed him as the pastor at Ephesus and then departed. That could have been the case, when he left. Or another is mentioned in Acts, chapter 20, when the apostle Paul goes to Ephesus and meets with all of the elders of that church on a beach and he addresses them. And he’s about to depart, and the Bible tells us that as they parted they wept allowed and they embraced him in a farewell. Sad, most of all, because he said they would never see his face again. Perhaps Timothy was among them when that departure took place and he freely wept. Well, it’s one thing to do that, but it’s quite another thing to have your name written in a letter that everybody in church is going to read. “Oh, you’re Timothy. You’re the guy that cries. You’re the tenderhearted dude that wept at that departure.” It could be embarrassing for some men to have that fact known publicly. Especially men in a culture like ours where traditionally we have told boys that it’s just not manly or cool to cry; it’s weak if you do. Men this is important for us to realize. Tenderness is a good trait, especially in a man. Any jerk can act aloof and macho. That’s the easiest trick in the book. That is not necessarily masculine. Because even God himself compares himself to a mother in the book of Isaiah chapter 66 verse 13. “As one whom his mother comforts, so I will comfort you; and you shall be comforted in Jerusalem.” That’s God comparing himself to the tenderness of a mom. Most of us learned tenderness from our moms. And I believe that is precisely where Timothy got his tenderness, from his mother and from his grandmother, the two women that would show it the most. Being emotionally present is a good thing. If there is anything we should learn from the women in our lives is to honor the fact that many times they help us to understand how to be tenderhearted to those around us. The next trait we see that Timothy had passed down to him was a sincere faith. Can I say this is one of the things I most appreciate about my mom. She showed me what it was like to be a Christian with a sincere faith. Did you make a note that in that text of Scripture his father is not mentioned? His mother is. Grandma is. There’s no mention of his father. Why is that? It’s because we believe that his father died, or possibly he left the family, being an unbeliever. We’re told in Acts 16 when we are introduced to Timothy, it says Timothy was “the son of a certain Jewish woman who believed, but his father was Greek.” The text seems to indicate that we’re dealing with a Jewish woman who believed that Jesus was the Messiah, but Timothy’s father was an unbelieving Gentile. What does that mean? Simply this: Timothy got his faith matriarchally not patriarchally; from his mother, not from his father. We know this further by the fact that Timothy, though he was raised by a Jewish mother, was never circumcised, because Paul has to take him as an adult young man and get him circumcised to bring him on his journey to the Jewish nations. Now why didn’t he get circumcised? Probably because dad said, “Uh, that’s not gonna happen. I’m a Greek. We don’t do that. You Jews do, but I’m the dad—not gonna happen.” So it never did happen, even though that was that was part of the covenant ritual that every male Jew went through. But his name, I believe it was his mom who picked that out, because the name Timothy means one who fears the Lord. That sounds more like a Jewish woman who’s a believer naming her son that, rather than an unbelieving Greek. Timothy, one who fears God. Let me say this up front because I know many times women come to accept Christ more readily than men do. If you are in a relationship with someone who is not a believer you can still make a great impact in the lives around you. As I have said growing up my mom was a believer but my dad was not. It was because of her faithful walk with God, her patient sincere faith that all of my immediate family is saved, even my Dad. We do not know the complete back story here. God’s word is clear that believers are not to marry unbelievers. And Eunice (Timothy’s mom was a Jew so why did she marry a gentile). But this we do see, Eunice’s story is in the Bible to give hope to women in mixed marriages. If her son, Timothy, could grow up to follow the Lord as he did, then God can do the same for your children, even if your husband is not a believer. 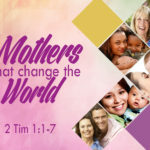 While God intends for the father to take the lead in the spiritual training of the children, the mother can have a great influence even in situations where the father is passive or hostile to God. Sincere faith is is so important. In our relationships with each other let us strive to have a sincere faith. Let’s not say we are Christians and then curse like a sailor and think that that is sincere. Let’s not come to church and act like Jesus has first place in our lives and forget to take Jesus (or our Bibles) home with us. We must strive to have a sincere faith. Tenderness, Sincere Faith; here’s a third investment: boldness. Verse 6, “Therefore I remind you to stir up the gift of God which is in you through the laying on of my hands,” writes Paul. “For God has not given us a spirit of fear, but of power and of love and of a sound mind.” The principle is simple: the product of genuine faith is faithful service to God. All the years of tenderness, all the years of teaching, will come to fruition and be worth it. Keep the fire going, keep the fire alive, fan the embers of your flame, don’t let them die out. The principle is simple: tenderness and godliness provide the impetus for boldness. They give a child all that is necessary for them to face life with that attitude of “I’m going to make it through. God’s going to do it. I’m not going to shrink back. I’m going to be bold.” Moms, the seeds you are sowing now in your young child’s life, you won’t see them germinate for a long time, but when they grow, you could possibly see this—a bold, effective witness. Want to know what happened to Timothy? I’ve told you a little bit already. He joins Paul on a second missionary journey. You know how old he is when he starts? Late teens, early twenties. Christianity has always been a youth movement. 8 So do not be ashamed of the testimony about our Lord or of me his prisoner. Rather, join with me in suffering for the gospel, by the power of God. 9 He has saved us and called us to a holy life—not because of anything we have done but because of his own purpose and grace. This grace was given us in Christ Jesus before the beginning of time, 10 but it has now been revealed through the appearing of our Savior, Christ Jesus, who has destroyed death and has brought life and immortality to light through the gospel. 11 And of this gospel I was appointed a herald and an apostle and a teacher. There is a lot more we could look at but let me close with verses 13 &14. Look at he instructions to all of us. Keep the pattern of sound teaching, of faith, and of love in Christ. Guard what has been given to you. Guard it with the help of the Holy Spirit who lives in you.